A system, such as: a computer, mobile or device like microwave oven, must need software to function. A software is a set of coded instruction for the system to execute in order to have it's hardware parts performing actions. However, software is primarily of two types, system software and application software. Software that manages and operates the system's hardware resources like I/O devices, memory devices, processor etc. is called a system software. 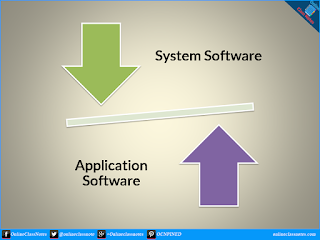 A system software also let application software to perform actions. An application software performs one specific task or a set of specific tasks by taking instructions or permissions from user and using system software to use system resources computing and outputting information back to the user. System software have full access to memory, disks etc. Application software has limited or allowed access to memory, disks etc. System Software: Operating systems, BIOS, firmware etc. Application Software: Word Processors, Games, Internet Browsers etc.